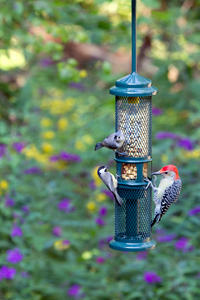 Providing shelled peanuts is a great addition to the choices you offer your backyard birds. Peanuts are a high-energy food and are enjoyed by a wide variety of birds such as woodpeckers, titmice, nuthatches, chickadees, jays and more. Many of their visits will be to carry peanuts off and cache them for a later meal. Hang this bird feeder in your favorite tree and watch peanut loving birds, such as jays and woodpeckers, fly in for a meal. 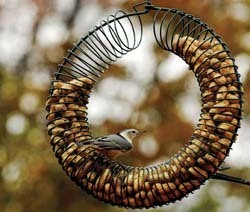 It's durable, yet it remains flexible so birds can pull out the whole peanuts. Multiple size openings make it possible for a variety of birds to feed. 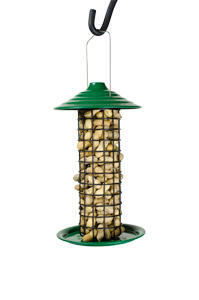 This versatile bird feeder is also great for offering suet balls or nesting material. Our Peanut Hut is the ideal way to offer peanuts in the shell. The large mesh openings are designed to allow the peanuts to be removed easily by peanut-loving birds, including woodpeckers, titmice, nuthatches, chickadees and jays. The Peanut Hut is easy to fill, and its tray accommodates perching birds and helps keep empty shells from falling to the ground. 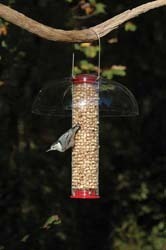 This feeder allows you to serve peanut pick-outs or Bark Butter® Bits without feeding the squirrels. The weighted desing of this feeder shuts off the feeding area when something heavy (squirrels) try to eat from it.